From Carnoustie, follow the esplandade along to the end and then onto to East Haven. There is a track which runs alongside the railway align and then leads on to a path that runs alongside the Arbroath Golf Club. Just beyond the golf club there is a crossing across the railway which I advise you to take. I kept to the shore side of the railway but had to walk through long grass alongside burn at Elliot. However the burn is eay to cross at the beach, and from here it is a simple walk along the beach into Arbroath itself. 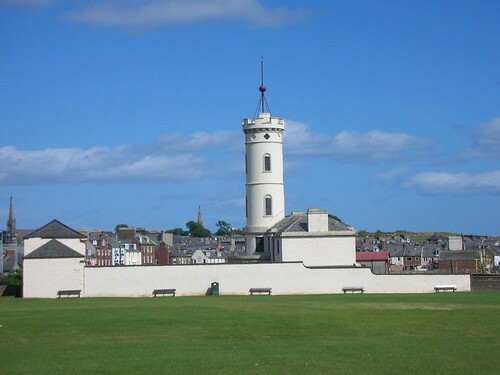 Once Arbroath is reached, pass the harbour area and head out towards the cliffs at the northern end of the town. There is a well marked path along the cliffs which is part of a Seaton nature reserve. The path continues, but ends near Carlingheugh bay. From here, the best option is to walk along the side of the fields until the village of Authmithie is reached where this walk ends. It was another glorious day, with lovely late August sunshine. Autumn had arrived and I think that this season is my favourite time of year. It has given me a chance to look back over the summer and see the season change from early summer through to autumn. Im still undecided whether I will walk through winter as well, there will be much daylight to walk, and the distance getting to the start of each walk increases all the time. Still, I can decided that after October. Emma and her boyfriend Richard were here to meet me in Arbroath which is a place I remember from when I was small and the family would come here during the summer holidays. I remember the cliffs at Arbroath well enough as Anne, my sister and I climbed them and almost got stuck half way up. There are big dispay posters at the start of the cliff walk now outlining the dangers of these cliffs (see photos). I suppose we were lucky that we managed to climb back down safely, but it must have been scary for me to remember it about 35 years on! You are currently browsing the Scottish Coastal Walk blog archives for the day Monday, August 29th, 2005.